Dog sweaters aren't just for dress up. Some pets honestly need these garments for protection from the elements. Here's the picture. You're walking down the street, and you see a person taking their dog for a walk. Completely natural, right? The only thing unusual is the canine is decked out in a colorful dog sweater and booties to match. At first glance, you might think it's a little silly to put clothes on a dog. After all, they have fur don't they? The real fact is that while some dog breeds are fully equipped to deal with snow and ice, others are not. Huskies are a great example of dogs that need no extra help weathering the elements. Their dense double coats provide excellent insulation against bitter winter winds, while their feet have thick pads that resist freezing. On the other hand, consider the humble little Chihuahua. These small dogs evolved in the southern hemisphere where the climate is quite tropical. Their coats are relatively thin, even in the long coated variety, and their tiny feet are certainly not built for plowing through the snow. Chihuahuas, along with many other breeds, are a prime example of pets that can benefit from wearing dog sweaters. Sweaters provide insulation these pets would ordinarily lack, making it possible for them to stay outside longer in cold weather and get their exercise. The best sweaters are designed to keep your dog warm without hampering his movements or ability to relieve himself. Sweaters come either with or without necks. Garments may have front sleeves or be secured to your pet using chest straps. The main body of the garment should cover your pet's entire back up to the tail base, and only fit around the torso, leaving the rear area exposed. If your dog falls into the category of canines that could really use dog sweaters, then you'll need to make sure that the garment you purchase will fit him properly.Let's talk about overall comfort first. 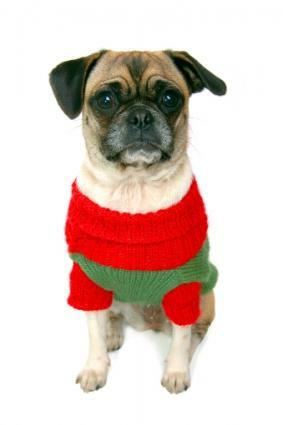 A dog sweater shouldn't fit your pet too tightly or he might resist letting you put it on him. Struggling to get the material over his head and around his torso will make your pet feel trapped. He will then likely fight to free himself from his sweater even after you do get it on. He may also be too busy nipping at it to carry out his business once he's outside, defeating the reason for his walk in the first place. A sweater shouldn't fit too loosely either, or else your dog will easily slip it off his shoulders and step out of it. It's essential to find a balance between loose and tight to achieve a proper fit. You'll likely find quite a bit of difference in sizes from one manufacturer to the next. One company's extra small may be another company's small and so on. The chart below will give you a general idea of how sizes run, but there is no substitute for measuring your dog if you want to assure a good fit. You will need three basic measurements from your pet to determine which size category he falls into. The combination of these measurements will help you match your pet to a particular size no matter which manufacturer you purchase from. Keep in mind, stretchy items will have some give, but sweaters made from less pliable materials may require you to select a garment for your pet from the next largest size category. Also keep this in mind if your pet is on the border line between sizes. If you enjoy knitting or crocheting, you might find it very satisfying to create your own pet sweaters. Most patterns allow you to adjust the number of stitches to achieve the custom fit your dog will appreciate. Try the following websites for patterns. Dog sweaters aren't just for fashion; they actually serve a purpose for dogs that need them. Carefully consider your dog's build and coat texture to determine if he would benefit from wearing a little something extra to help stave off the cold.